Tableau Software, innovators in visualizing data analytics, contacted Busse Design to help them promote and design their new desktop product, Tableau Public. Tableau Public allows users to create and publish visualizations ( "vizes" ) to the web where others can manipulate data views and reports, and repost them, encouraging viral sharing of these unique data views. Busse Design's challenge was to optimize the interface so that both power users and novices could easily publish their vizes and interact with those created by other users. We achieved this by simplifying the workflow and visually prioritizing user actions on each screen. 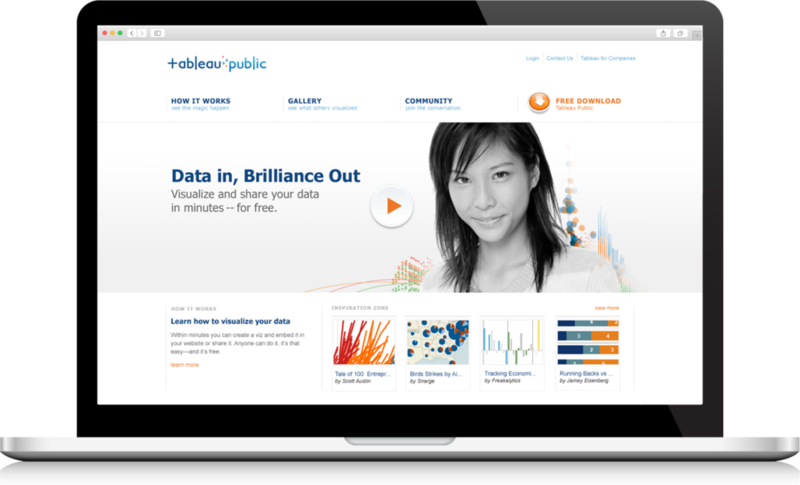 Finally, we updated the Tableau Public landing page at www.tableaupublic.com to showcase the product's range of possibilities.